Riikka Paasikivi joined Spinverse in March 2015 as a Senior Consultant to help companies in EU/Horizon 2020-project proposals and funding. Her recent projects have regarded next generation pharmaceuticals, aid for sleeping disorders and nanomaterials in cosmetics. Riikka has a long and broad experience in biotechnology and health industries, both in private companies and in public side. She has 10 years of industrial and international business experience in companies like Finnzymes Oy (Thermo Fisher Scientific Oy), Genencor International Inc. (Cultor Ltd), and Orion Diagnostica, working as an export manager, technical service specialist and process development engineer. In 1992-1996 Riikka worked as a Scientific Attaché in Brussels, Belgium for The Finnish Agency of Technology and Innovation TEKES helping finnish companies, universities and research institutions to participate in EU R&D programmes and to provide information in the opportunities offered by various EU instruments. 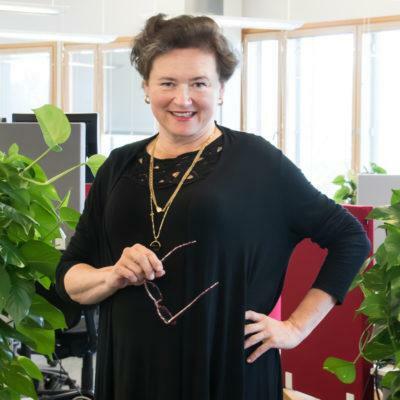 For running a succesfull EU-information campaign for Finnish industry she was nominated as a Scientific Attaché of the Year in 1995. Riikka has also acted as an independent evaluator, program monitor and observer for the European Commission. She has participated as a partner in several EU-funded projects and acted also as an EFQM-evaluator in Excellence Finland competition. Riikka got her M.Sc. in Chemical engineering in 1988 from Helsinki University of Technology (Aalto university), where she also continued her studies in a postgraduate program in professional development (PD) in Innovation management (1999-2006). She has also studied international politics in Université Libre de Bruxelles and European studies in College of Europe in Bruges, Belgium. Riikka is a trained classical singer. In her free time she regularly performs in solo concerts, opera productions and she is a member of the Symphony Choir of the Helsinki Music Centre. Riikka also enjoys gardening and jogging with her two standard poodles – Boris and Carlos.